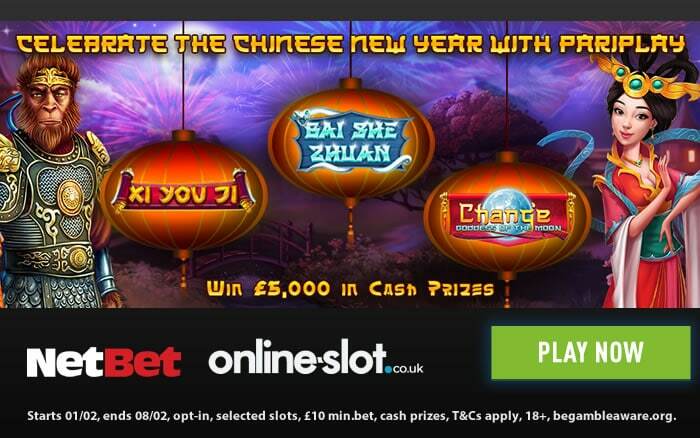 Welcome the Chinese New Year with a share of £5,000 in cash prizes as NetBet Casino and Pariplay team up for a superb promotion. The eligible Pariplay slots include Chang’e Goddess of the Moon, Bai She Zhuan and Xi You Ji. Chang’e Goddess of the Moon is a 5 reel, 20 payline slot where the wild locks in place for up to 5 spins. There’s a Free Spins feature where up to 50 free spins can be won – these take place on a 243 ways to win engine where you’ll benefit from sticky wilds. Bai She Zhuan is a 5 reel, 25 payline slot which comes with 2 different wilds – you have an expanding serpent wild and a turtle wild that expands 1 position. They both remain sticky for the subsequent spin. You can then collect various wins to fill 2 meters to trigger their own bonus feature. The Ba Suzhen’s Free Spins feature gives you plenty of free spins whilst the Fa Hai Bonus feature sees you open treasure chests to give you stake multipliers. Lastly, there’s Xi You Ji which is Pariplay’s newest slot. With 5 reels and 25 paylines, lanterns are filled with winning combinations to give you sticky wilds, access to the free spins feature, a cash prize or entry to the Jackpot Wheel feature where you can win up to 1,000 times your stake. There’s The Sacred Journey feature where the trail can lead to payouts of 1,000 times your stake. Starts 01/02, ends 08/02, opt-in, selected slots, £10 min.bet, cash prizes, T&Cs apply, 18+, begambleaware.org.